Main’s power reached high voltage to impress Motherwell manager Robinson! 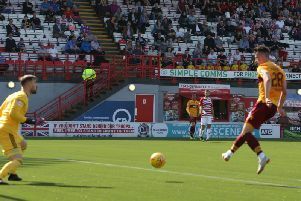 Motherwell manager Stephen Robinson hailed the performances of his new signings in the 1-1 draw at Hearts, with goal hero Curtis Main picked out for special praise. “I think the new signings have given us a really big lift,” Robinson said. “I thought Curtis Main was immense today, he was absolutely superb, worked his socks off. “Hearts have a good back three, they haven’t conceded goals, but I thought Curtis was a real threat all day. “It was two teams that are very organised and don’t concede many goals. “It was always going to be setplays that probably won the game, although obviously we equalised. Despite the fact that Motherwell were seconds from defeat at Tynecastle, Robinson felt that a draw was the minimum result his troops merited. “I thought it was thoroughly deserved,” he added. “Overall in the game we had one v one with Tanner through on the keeper, Curtis Main through on the keeper, Petravicius misses from about three yards with a header. “Curtis Main has another chance in the first half. Obviously the goal itself. Motherwell’s keenness to try and garner late points from Gorgie was illustrated by defender Aldred pushing up front late on. “It was a match changing decision... from Tom!” Robbo added. “You’re chasing in the last minute of the game, you throw everything at it and I think it rounds off the spirit we have in the place.